Sophie, our little double-pawed ball of sweetness was missing for about 18 or so hours. Two nights ago we called her in as the sun was about to set, but she didn't come. Sophie and her brother stay outside at night sometimes so we thought we'd just let her be out if she wanted to be out, but the next morning she still wasn't around which isn't typical. I had experienced this once before. Porter, the most incredible cat I've ever known, didn't come home one night and he never came back. I had gone up to the field with him to water the sunflowers and as we were crossing the little bridge over our driveway he stopped and looked at something in the shallow water. I turned around and said, "Come on, Port". He stared at me for such a long time and I just looked back at him kind of interested in how long the gaze was lasting. Looking back I feel like it was our goodbye. I said "Alright fine, rascal" and the second I said that he jumped off the edge into the culverts. That was the last time I ever saw him. The fox that undoubtedly got Porter tried to get one of our chickens. I chased the fox who continued to chase the chicken. The three of us sprinted in a line down the driveway. The fox finally gave up, but the chicken had run off the property and was nowhere to be found. That was two days after Port went missing. The reality caused my knees to bend and I sat in the yard crying. I knew Port wasn't coming back. My favorite chicken did end up squawking her way down the driveway two hours later (which blew my mind), but she has since fell victim to the fox and has been gone for about half a year. You would think I would guard my animals like a sheep dog after these experiences, but they are animals and they know the dangers out there and they still prefer to be out... to see, to live, to experience. Temple Grandin says cats are still wild animals. Their natural instincts to survive have not been bred out of them. When the cat looks out the sliding glass door longingly, I'm going to let it out. I went to the spot she usually hangs out in. It's over by the chicken coop where the chipmunks come out to eat the expensive organic chicken feed. I called her name and she responded instantly. I couldn't believe it. The poor thing had climbed to the very top of a tree with absolutely no branches on it. She had been up there for a solid night and half a day and looked completely and totally displeased with life. She was nervous. Her cry was constant, drawn out, and exhausted sounding. Caiti tried to offer her a small tree that had a few branches on it, but Soph didn't deem it safe enough. Later on she did use the branch I offered to her which actually ended up being a bad idea. Once she put her weight on it I couldn't hold the stick up. Luckily, disaster was avoided when she realized I couldn't hold her weight on a stick and balance in a spindly tree and she stepped off. It took us about an hour to get her down, but eventually we did. 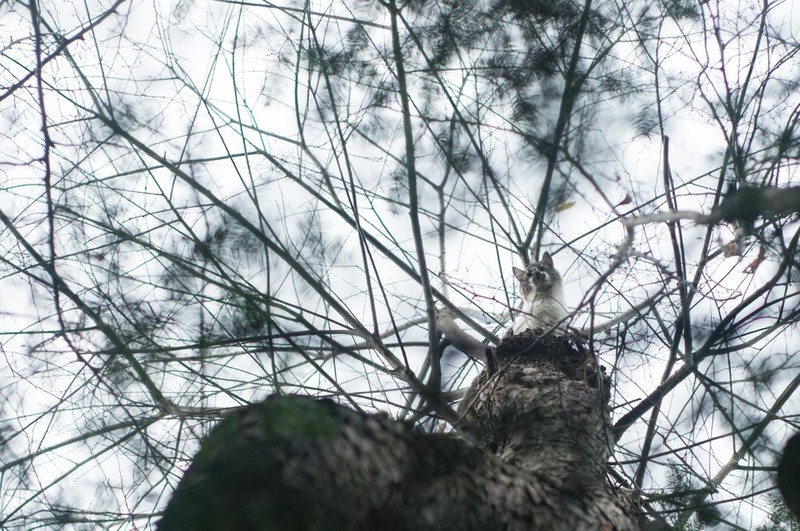 I climbed up the spindly pine tree that was growing somewhat close to the branchless tree that Sophie was in and tried to coax her to jump to me. She almost did. She wanted to so badly, but it was a scary jump to make with bad footing and she was so tired. She stayed this way for a surprisingly long time. I think she had either given up on life or was taking advantage of the fact that she could rest for a moment. What was she resting on? I don't really know. I think she was partly levitating. She had reached some sort of enlightenment in her near death experience and now had the ability to float. Somehow she scrambled her way out of this situation and go to the other tree. She was too tried to climb down and only cried. I made my way back up the tree and she collapsed into my arms. She didn't even slightly attempt to reach for the tree as I awkwardly climbed down. I would have to drape her over my shoulder or lay her on my knee as I inched my way back down. She just stayed wherever I placed her. Once I got low enough I dropped her to Cait who caught her. Today Soph is back to her loving, purring self, but for the rest of the day yesterday she was on top alert looking for whatever had treed her. Oh... the life of a cat in NH.